CHICAGO – John Cusack’s new spy thriller is so routine, predictable, and dull that they could have called it “By-the-Numbers Station”. Too easy? How about “Paint-by-Numbers Station”? OK, I’ll stop now before @FakeShalit comes after me. “The Numbers Station,” now available On Demand and opening in Chicago this Friday, isn’t an awful film (it’s better than Cusack’s last dud, “The Factory”) but it’s a remarkably boring one. Co-star Malin Akerman does her best to try and add some character but director Kasper Barfoed can’t figure out the tone of this non-action spy movie and Cusack looks visibly bored. If someone had a camera on you while you were watching it, you would look the same way. 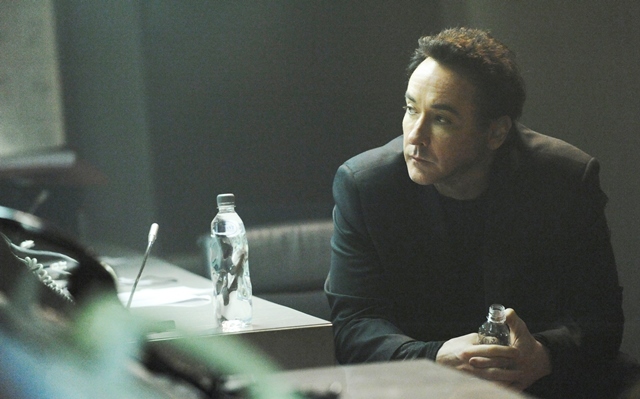 Casting against type, Cusack plays a CIA Black Ops agent named Emerson Kent. After an innocent bystander witnesses Kent performing a “job” and asks him why he’s doing it, Kent has a crisis of conscience, one that’s amplified by the fact that his partner (Liam Cunningham) then does what he cannot – kills the witness. Kent is shattered enough that he’s basically given the equivalent of a desk job in his unique profession – asked to guard a code operator named Katherine (Malin Akerman). This average citizen works alone at a top-secret CIA “Numbers Station” in the middle of nowhere, delivering codes into a system of espionage that she doesn’t understand or fully comprehend. The numbers mean something to the recipients who have ever-changing ciphers to decode them but nothing to Katherine. She is the operator of the phone system of the spy network. Kent has barely had a chance to consider the likely tedium of his new assignment when he’s called into spy action. The pair is arriving for another day of work in the spy quarry when they realize that the duo that had the shift before them has been compromised. Explosions, gunfire, and the realization that the bad guys have found a way into a reportedly foolproof system and could have essentially destroyed most of the CIA Black Ops operations around the world follow as Kent and Katherine could be the only two people to save the Agency. Who was behind the attack? Will Kent be able to hold up given his recent trauma? Why should we care? The structure of “The Numbers Station” – an assault on one location a la John Carpenter’s work in a film like “Assault on Precinct 13” – requires two filmmaking skills that simply aren’t on display in Kasper Barfoed’s direction and F. Scott Frazier’s script. First, Barfoed needed to present the viewer with a more concrete sense of location and time. Where are our heroes? Where are the bad guys? How are they trying to get in and what is being done to stop them? “Assault” films need an urgency that is just missing from Barfoed’s lazy work. The action isn’t engaging as it feels so cheaply designed and poorly executed and there’s just no tension in the director’s use of setting. We need to see the sweat on Kent’s brow, feel the walls closing in, know the enemy is near – none of that is here. Frazier’s script certainly doesn’t help as the debut writer doesn’t give enough weight to the two characters at its center. I have a feeling that “The Numbers Station” once started as a character piece to be made by an indie director. It really only requires a handful of actors and limited location, which implies an emphasis on character – A drama about a spy questioning the morality of his profession and the innocent bystander who gives him a shot at redemption. Everything that works about “The Numbers Station” comes from that character-driven concept. The action and spy thriller awkwardly placed on top of it is why the movie fails. Cusack doesn’t help. Surprisingly, Akerman, who I’ve found thin in the past, actually works here. It’s Cusack who seems uninterested in the material. I’m worried now that this great actor is taking paycheck parts like this and the abominable “The Factory”. The last great performance from a star who delivered in such underrated fashion in films like “Say Anything,” “Grosse Pointe Blank,” and “High Fidelity”? 2007’s “1408.” I really like Cusack but he needs to play characters he finds interesting to deliver and he clearly doesn’t find Emerson Kent interesting. You won’t either. “The Numbers Station” stars John Cusack, Malin Akerman, and Liam Cunningham. It was written by F. Scott Frazier and directed by Kasper Barfoed. It is available On Demand and will be released in Chicago on April 26, 2013.